Sandra Perlow walks down the street and collects a stranger’s glimpse, a houndstooth check, a ripped poster, a ruby hand, perfume and smoke, a curlicue shadow cast on graffiti. This salad of sense impressions feeds Perlow’s rootstock of shape and line. In the studio she transcribes the urban novella from memory, re-tracing the crowded path, the wrong turn, the involuntary bump of a passerby. Observe, create, reflect, modulate. The world is not settled; it is an abstraction that begs for revision. Rhythm is a key property of Perlow’s multi-media paintings and works on paper. She achieves rhythm horizontally, across the picture plane, and dimensionally, through an accretion of layered materials. Like the dense and pulsing city, the surfaces of Perlow’s artworks are the product of collaboration among interrelated and jostling layers. She paints atop a ground of patterned textiles, soft-edged stencils, and toothed woodcut prints. This subcutaneous network pumps life to the surface, providing a scaffold for riffs and revisions. Rhythm, like human relationships, is sometimes dissonant, sometimes harmonious, but difference produces texture, tonality, and little games for the eye to play. Perlow’s method is generative. If she cancels a pattern with a field of paint she revives it with gestural oilstick drawing. Things seem to grow of their own accord, and color is unbound. Indeed, each painting is a small ecology of idiosyncratic shape and color. Matisse wrote of the “roles” of the formal elements in his paintings, like characters in a dramatic narrative, and this is a handy approach for Perlow’s works, with forms bristling, gyrating, coming into being and flourishing, reactive, sensate and touching. The narrative is not literal but lyrical. It is a narrative of characters tested in odd contexts. When chartreuse abuts evergreen the mood shifts into strange, and when peach tickles orange a discovery is born. Titling her recent paintings from snippets culled from Middlemarch reflects Perlow’s entrance into a world of narrative amusement. Perlow’s finished compositions could be decompositions, just as a collage is composed of re-born detritus, just as newly built architecture contains the seeds of its future ruin. The paintings are a record of the artist’s moves, improvisations, intentions, and intuitions. If narrative literature depicts characters as propelled by desire, then what desire is embodied in an abstract narrative painting? What inner life reveals itself on the surface? 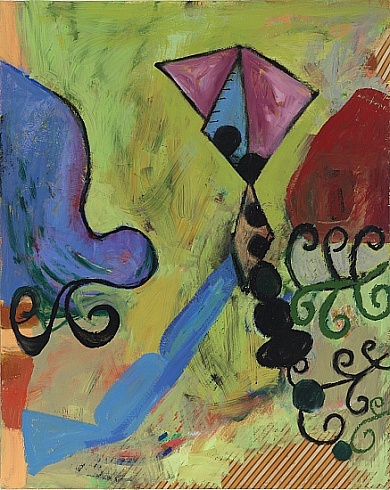 Perlow’s active abstractions are retainers of experience and memory. When she smushes a monotype against its surface, that is a record of life happening. Memory is a prism, and painting is prismatic.